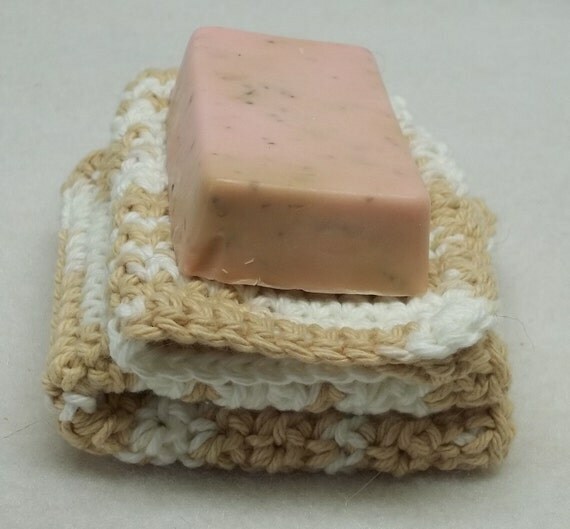 -This is a listing for 1 set of beige facecloth/face scrubbie. -Both are made with reclaimed cotton yarn left over from previous projects or bought here on here on Etsy. -This duo is great because you get a hand knit facecloth and a face scrubie which are both perfect to clean your face and body. -The skin on our bodies and face do take a beating every day. Between makeup, UV damage, pollution, and stress, it needs some pampering and occasional exfoliation. -And what better way to exfoliate then a hand crocheted face scrub/handcloth. -It's important to treat your skin with soft products such as this face scrub and facecloth. -When you are done, simply wash the items by hand and leave to dry and reshape, and they're good to go for another round. -You'll keep your items for a long time if you take good care of them. -It's also a good idea to buy other sets so you have a few on hand when you are washing other sets. -If you don't see your color, no problem just convo me and it'll be my pleasure to work with you. -Great for gifts in a basket or a simple thank you gift for a hostess. -Please take note that the more you wash these crocheted items the softer they'll get. ''Believe me... I have bought TONS of these BUT THESE ARE BY FAR THE BEST! Nice tight weave... BEAUTIFUL WORK! Thank you''"
---I always refund through Paypal any over shipping charges.